Search for the best flight prices from Stansted to Faro. Compare prices, book today and save money with Stansted Airport. As the gateway to the Algarve, Faro is blessed with sun-kissed villas and a bustling student population that keeps local entertainment and nightlife scenes strong. Festivals and exhibitions are regular, with a key event in the summer months the internationally popular motorcycle rally. Here bike enthusiasts from around the world light up the city with an exciting collection of rock music, parades and outrageous stunt riding displays. Whitewashed villas, hotels and beachside resorts punctuate the sun-drenched region around Faro, delightfully framing this Algarvian gateway. A mid-range option in the city itself is the Hotel Eva (Avenida da República 1), although it still boasts a rooftop pool that overlooks the marina. Most visitors tend to head out and explore the coastline however, including Albufeira which lies 45km to the west. The five-star CS São Rafael Atlantic Hotel (Sesmarias) is a modern choice with its own private beach. 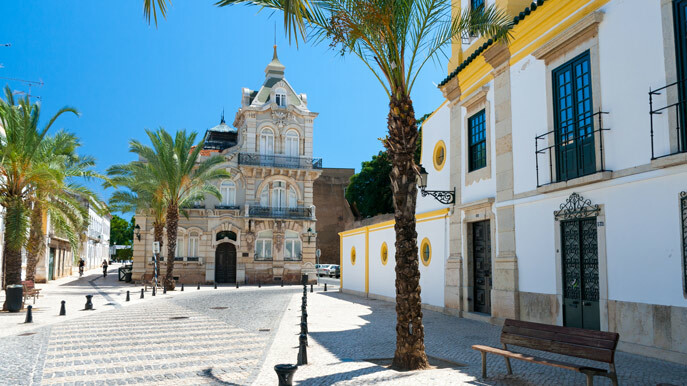 In the other direction, the sumptuous Pousada de Tavira (Rua Dom Paio Peres Correia) is housed in Tavira’s 16th-century Convento da Graça, offering modern luxury without relinquishing its historic character. The pedestrianised Rua de Santo António and its surrounding streets are found in the heart of Faro, offering plenty of opportunities to shop for clothes, gifts and souvenirs. Largo Mercado holds a daily market, although the largest market in the region is found 18km north of Faro on Saturdays at Mercado Municipal (Largo Gago Coutinho) in Loulé. Goods such as woollen items and Moorish-style pottery complement a selection of other local crafts. For those captivated by ceramics a trip 20km west of Albufeira to Porches Pottery (EN125) will prove worthwhile. A renowned hand-painted pottery workshop in Porches awaits, with the chance to purchase traditional terracotta tiles, plaques and crockery, in addition to ordering your own personalised goods. The Algarve bears a number of fruits when it comes to culinary delights, from piri-piri chicken to salt-dried cod and fresh seafood, all accompanied by delicious local wines. In Faro itself, plonk yourself down in the shadow of the cathedral in Sabores da Sé (Largo da sé 10) and sample the Algarve’s cuisine in affordable and authentic fashion. Considered the gastronomic jewel in the Algarve’s crown, Albufeira’s Vila Joya Restaurant (Praia da Galé) is a must for fine-diners, and even offers the opportunity to observe two-Michelin-starred chef Dieter Koschina in full flow within the kitchen. In Porches, check out the Ocean Restaurant (Vila Vita Parc) and run the rule over an exciting new arrival on the haute cuisine scene. The middle of summer sees one of Europe’s biggest biker rallies hit Faro, as throbbing engines and roaring exhausts provide the backdrop for a leather-clad celebration of everything from rock music to tattooing. Tens of thousands of visitors enjoy the parades and stunt riding, before hitting the all-night bars after hours. Loulé’s historic Cerca do Convento do Espírito Santo plays host to a series of open-air concerts put on by a blend of international jazz performers and some of Portugal’s top artists. The programme is varied and intertwines traditional and contemporary jazz with wider influences. The festival of sardines unsurprisingly sees a vast amount of the tasty treats deliciously sizzling away in the Albufeira parish of Olhos d'Água in August. Fado music, folk dancing and fireworks accompany the freshly barbecued fish that satisfy the masses of hungry merrymakers. This festival to honour the patron saint of local fishermen is Albufeira’s biggest event. Mass at Igreja Matriz and a procession to the beach and back kicks off the event in sombre style, although the pace picks up quickly with parades, festivities and fireworks at midnight. The locals of Faro use this celebration of their patron saint, Santa Iria, as a worthy excuse to have a good old knees up. Largo de San Francisco is the main setting for the music, games, exhibition and crafts, not to mention the fairground.